What if you want a lot of peppers? I recently received a comment from someone who only wanted two crops in their garden and wanted to know how to space those crops. 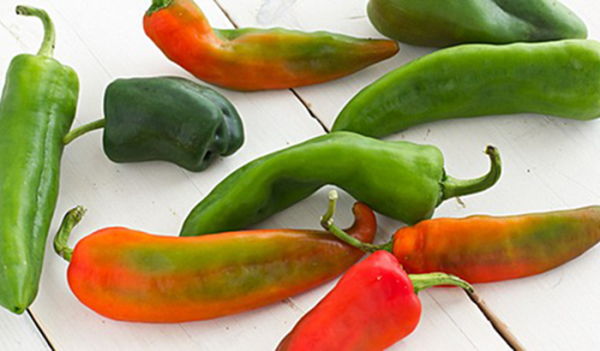 If you want a lot of peppers, or any other crop in bulk, and you are not sure how to space it in your garden, I would suggest consulting how many of that crop should be planted per square foot. Larger plants, and plants that need to be trellised, or vertical, should be on the north of your box while smaller plants can be positioned near the south. In the case of peppers, normally a person would have two or three pepper plants in their whole garden, not eight or ten. It’s best to space them out for several reasons: one is pest and disease protection, another would be for staggered harvest, and a third would be just for good looks. Remember we are looking for a quilt look to our garden. However, if you want a lot of one thing, such as peppers, then they can all be placed together, even different varieties, so it makes harvest easier. 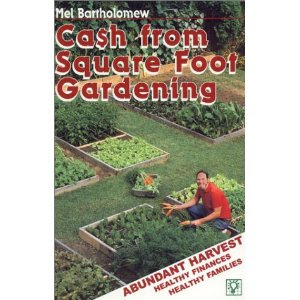 This is all laid out in my second book, CASH from Square Foot Gardening. The idea of that book is to raise a crop to sell, as if you were a farmer, not a home gardener. In that case, you want a large harvest all at once to go to market. If you read that book you will see that an entire 4×12 bed was planted with one crop, either all at once, if it was a summer fruit crop, or the harvest was staggered in a wave action, if you wanted a continual cool weather crop, so that also depended on the harvest you were looking for. Concerning tomatoes, if you’re planting a bush variety, if you’ll check the book, you’ll see it needs a 3×3 area. This allows it to grow large and produce enough crop for the season. The only time we plant one tomato plant per square foot is when we trim that plant to a single stem and grow it vertically up a tomato frame. Those are called vine plants versus bush plants. In a normal 4×4 you could plant two ways, depending on the crop type. 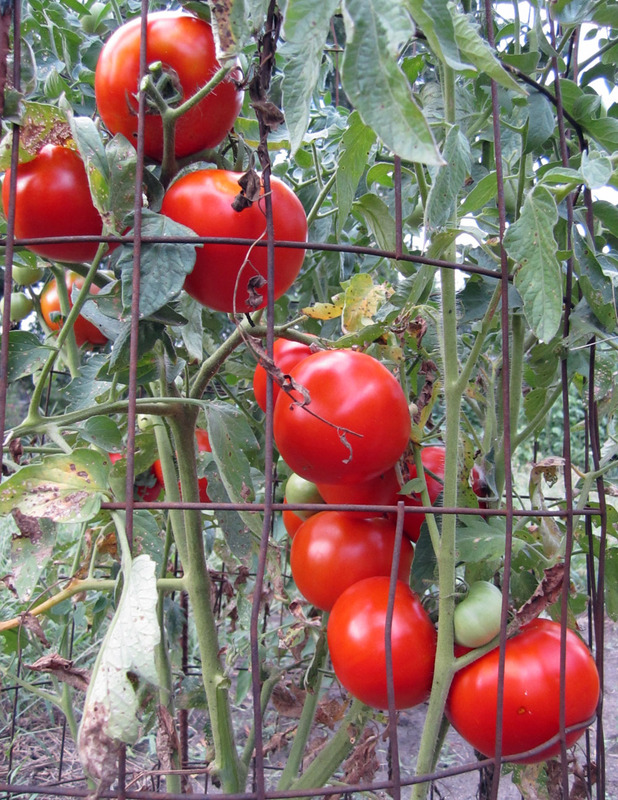 With vine tomatoes, you can plant 4 tomato plants along the north side where you have space for a tomato tower, or trellis, to grow them on. With bush tomatoes, you can put one in the middle of a 3×3 area, or one per 9 square feet (boxes). The outer ledges would contain 7 more squares and you can put peppers in there, since peppers and tomatoes are usually seen together in the garden and on the table together, or another crop of your choosing. However, I would not plant vine tomatoes with bush tomatoes. Keep those varieties separate. It might help to draw a picture of a 4×4 square bed with 16 squares and then you can see much better how many plants and of what varieties can be put in a 4×4. Just keep in mind the spacing for each particular crop. For the crops that require 9 square feet, like the bush tomatoes that you mention here, and bush-type squash (most zucchini and yellow squash, among others) is the required 9 square feet for space or for required nutrients, or both? It seems to me that if the reason is only for space, you could plant these crop types in a 2×2 standalone box, leaving enough space on the outside of the box for the plant to grow. I think that this may save space and money overall. Interesting idea. First let’s talk about the bush plant itself. Most vegetables will send their roots about the same distance that the leaves or stems go out. So with that theory, you would need equal space for both top and bottom. You’re basically asking how much space does a large bush tomato plant need. First below ground for the root system and then above ground for the plant itself. So most cases, equal amounts. So for that theory, you would need 3×3 below and 3×3 above. However, it is possible to crowd the roots and put it in a smaller container so that the top parts hang over the container itself. I’m sure you’ve seen large bushy type plants in smaller flower pots. But in that situation, you would have to add more nutrients to the smaller amount of soil. This can be done with organic or chemical fertilizer (your choice) or by increasing the amount of compost in your potting soil. I”m not sure why you think that would be less costly because you would need extra box sides and more construction and sometimes, if you have too many containers here and there, some of them are sometimes forgotten and don’t get watered properly. So as the saying goes, Jessie, pretty much the choice is yours. Now if you have any youngsters around, you might challenge them to a marvelous science project. Put identical plants in both locations and keep a log of measurements and photographs right through the whole season. Count and weight the fruit harvest, which is ready to pick first, and which one lasts the longest. If you would like to do that, I would be glad to publish the results in one of our newsletters. Hope that answers your questions adequately, but now you have a choice to make. Get your dime out and flip a coin. Thanks for an interesting question. It was fun to think about. Thanks for the info. Much appreciated. I knew that the roots-to-branches ratio was about the same for most plants, but I had forgotten that when I was thinking about this application. The reason that I think it may be cheaper is because for me, the vermiculite is by far the most expensive component of the SFG. If I can effectively crowd the roots while still giving enough nutrients to the plants, I think that I may be saving money. It may be a couple of season before I’m able to do an effective experiment – I’ll let you know when I do. Thanks for your answer, now I understand why you felt it would be less expensive. Keep in mind on any expense, a wooden box garden filled with Mel’s Mix and added grid is going to last you probably 10 years…maybe more. So whatever it cost that first year, divide that by 10 and that’s your yearly cost for a garden because there’s nothing more to add later except for a trowel full of homemade compost every time your replant each square with a different crop. And of course your water bill. But remember, a SFG takes only 10% of the water of an old fashion, spreadout, single-row garden. So if you could determine the amount and cost of the water you used to use, you could subtract the savings against the yearly cost of your Square Foot Garden. Thanks for the notice on your blog. Good luck with your garden this summer!